Bob Duffy has a new role, in addition to his regular job as president of the Greater Rochester Chamber of Commerce. It was announced at a meeting of the Finger Lakes Regional Economic Development Council on Wednesday that Duffy has been appointed Co-Chair of the council effective immediately. He replaces Danny Wegman, Chairman of Wegmans Food Markets, who served as Co-Chair since the council’s inception in 2011. Duffy joins MCC President Anne Kress, who is still the other Co-Chair of the council. Kress said it was an honor to work with Wegman who established the importance of collaboration in the region, but she is looking forward to working with Duffy as well. Kress said there is "no body who knows the Finger Lakes region, or really even New York State better than Bob at this point." She believes his optimism for the region and his focus on young leadership will be assets to the council. "We need to prepare future leaders to take on this responsibility for the economic growth of our region, and I know that Bob, in his role at the chamber has foregrounded that, so I'm excited for the potential there." 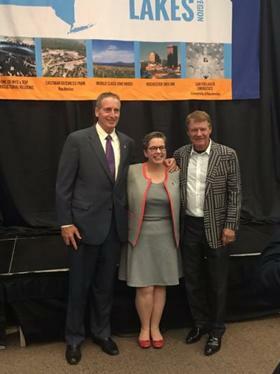 Wegman says it “was an honor to serve as a co-chair” of the council for the last six years, and he says there has been headway on a number of projects including rejuvenating the Eastman Business Park and building a more robust Ag and Food ecosystem. Duffy says thanked Wegman for his “incredible commitment” to the council and the community. Duffy is a former Lieutenant Governor and Rochester Mayor. When he was Lieutenant Governor he served as statewide chair of the Regional Economic Development Councils. University of Rochester President Joel Seligman is also a former co-chair of the Finger Lakes Regional Economic Development Council. He stepped down last year, and that's when Kress was appointed.